Following a brief Health and Safety message at the park entrance, the session commenced by searching for ‘Base Camp’. Base Camp turned out to be a sheltered 30/40m2 section of one of the woody areas in the park, with a small clearing in the centre that contained a seating area made from logs. l was particularly impressed to see how Base Camp was laid out in order to accommodate young children and help them to feel safe in unfamiliar surroundings, for example a make-shift potty area was made using tarpaulins that were cleverly tied to some trees to form a cubicle. Items such as paintbrushes and clay were also provided. 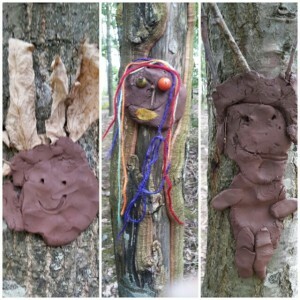 The children then explored Base Camp independently to find materials that they could use to turn into art, for example bird feathers, berries, soil, puddle water and crushed leaves. The idea behind this is that all natural resources have value, even if at first the items seem useless- for example clay can be moulded and twigs can be used draw or provide limbs to an animal in the making! During Forest Schooling every decision made by an individual is celebrated, regardless of whether the outcome is positive (ie painting with crushed blackberries) or not so positive (falling face first into a puddle)! In fact, play in this form is so critical to a child’s development that is was made a basic human right by the UN in the 1989 Convention for the Child Act. 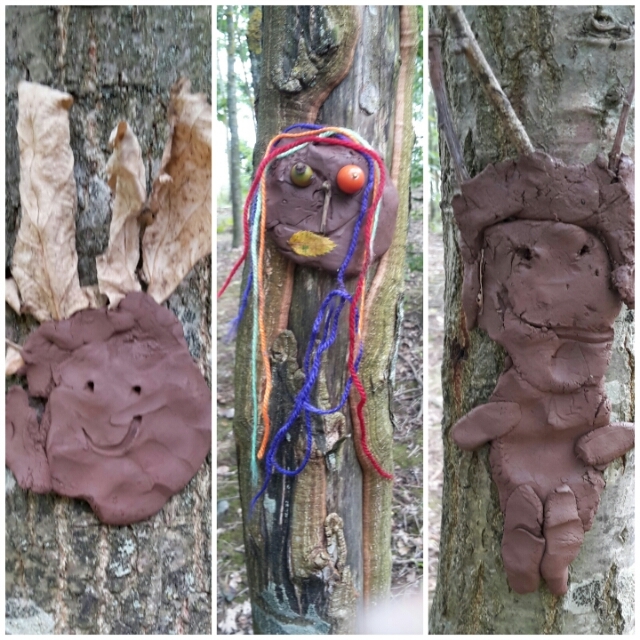 One activity was to make tree people- here is a selection of some! The Zoologist in me also saw how useful this session was in terms of teaching people the value of the natural environment – a source of raw material, a chance to interact with others during shared experiences and also great fun. After all, valuing the natural world as an adult often begins by kindling this appreciation as a child. Importantly, many of the parents who attended were shown new and exciting ways to engage their children and shown how useful being outdoors is for teaching qualities such as courage, thus encouraging the use of outside spaces in the future and again promoting the respect of nature in young people who will grow up to be the next generation of decision makers. This drew a conclusion to my four weeks with Bedfont Lakes, which was fantastically rewarding and eye opening. I would recommend the Charity Insights programme to all students, regardless of whether the projects they undertake do or do not directly relate to their degree subject. A massive thank you is due not only to the Countryside Team at the park but also to Imperial Careers Centre for making it possible!